Whether it is celebrating another ‘round’ number birthday, or an important family celebration, or perhaps the company or club is celebrating its jubilee, why not celebrate the special occasion with a donation to the Fundación Pueblo? A particularly spectacular fundraiser took place at this years Oltiger-Määrt. 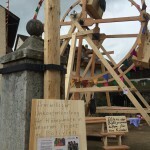 Tobias Martin and Florence Brenzikofer, former volunteers for Fundación Pueblo, delighted both young and old with their homemade wooden Ferris wheel. The voluntary contributions of the Ferris wheel riders directly benefited the “weekly boarding with host families” program. During their volunteering time in northern Potosí Tobias and Florence contributed to the management of this program and now that they are back in Switzerland, through Tobias’s impressive carpentry, they both continue to support the children and rural women in Bolivia’s poor regions. Here you will find information about the Foundation and our projects, which you can attach to your special invitation and make the day stand out. Spanish or German informative material you can find on their corresponding website versions.